For 35 years, Pat Sajak has been hosting Wheel Of Fortune with no major mishaps whatsoever. 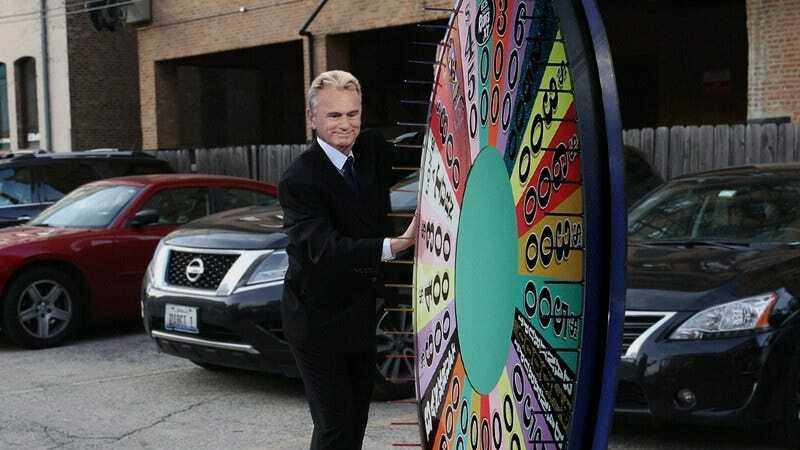 But last night something truly disastrous happened: The Wheel Of Fortune was stolen from Pat Sajak as he was rolling it out to his car to take it home for the night. Wow. What an appalling tragedy. After saying bye to his coworkers at 6:30 p.m. yesterday, Pat Sajak tilted the giant multicolored wheel from its spot in the center of the show’s iconic set and began to roll it out of the studio—a process he goes through every workday. But when Sajak completed his routine of rubbing the edge of the wheel in butter to help squeeze it through the studio door, pushing it across the parking lot and leaning it up against his car to catch his breath for a second, a group of hooded figures surrounded the legendary TV host and forcibly took the fabulous wheel from him. The aftershocks of this theft are still being felt, as the studio audience from today’s taping reportedly booed when Sajak unveiled the replacement wheel he hastily made out of poster board and markers. Hopefully, local authorities will find who stole the Wheel Of Fortune soon and return some order to one of the longest-running game shows. Until then, our heart just absolutely breaks for Pat Sajak and the throngs of Wheel Of Fortune fans around the world.